Galloway, D D. 2018. 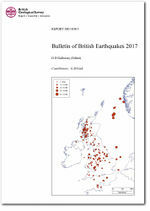 Bulletin of British Earthquakes 2017. British Geological Survey. (OR/18/015). This page was last modified on 25 June 2018, at 10:21.